Vliegt de Dakota straks niet meer? 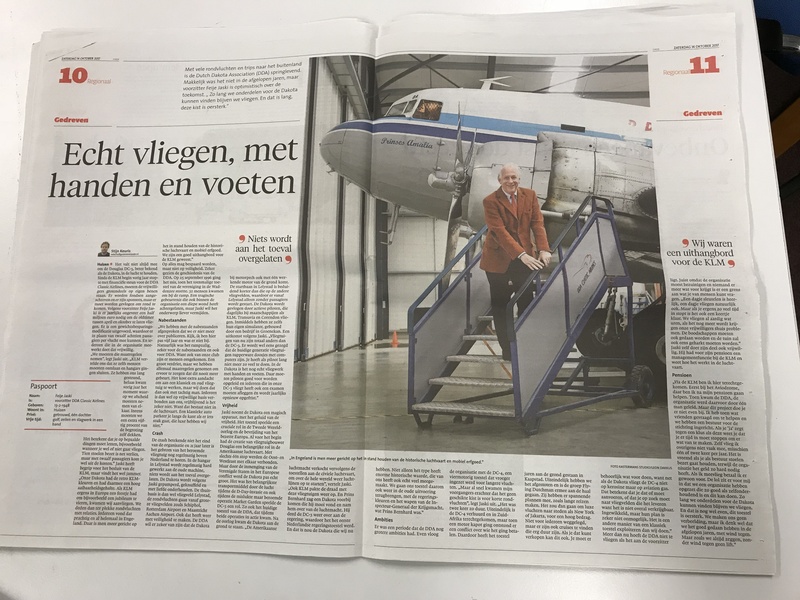 KLM stopt sponsering Dutch Dakota Association (DDA) hoe nu verder? Article in June "Kus de Kust"
Article from BBC Look North "If you thought you'd seen a rather unusual plane in the sky over Leeds Bradford Airport today... it was probably this!" Coverage at U tv "Belfast flight back in time with iconic aircraft"
Article in Dichtbij "Prinses Amalia over bollenland"
Article in Dichtbij "Vlucht met Dakota DC-3 boven kleurrijke streek"
Article in Grimsby Telegraph "Historic KLM DC-3 Dakota PH-PBA heading to Humberside Airport on Friday as part of UK tour"
Article in Airports International "KLM Treats UK Passengers to a Glimpse of Yesteryear"
Fragment on BBC "DDA DC-3 PH-PBA "Prinses Amalia" at Humberside Airport"